Ganglion cysts are fairly common. They are a benign tumor-like swelling that appear on or around joints. Although they are most commonly associated with the wrist, they can also occur at the finger, knee and ankle joints. They are not usually painful, but can cause irritation. Weakness and numbness may develop depending on their size, location and whether or not they encompass a tendon. Ganglion cyst patients usually come to see us at Caring Medical once the pain becomes constant and/or as the cyst begins to affect the function of the joint. Ganglion cysts occur in response to repetitive stress injuries or trauma, and sometimes they are idiopathic, meaning that develop for no apparent reason. Some theorize that there is a weakness in the joint capsule, allowing joint fluid to leak into surrounding tissue, and this weakness is like a one-way valve, not allowing the fluid back in. As with many joint issues, often times the underlying factor is joint instability, caused by ligament laxity. If, for example, through repetitive stress or a trauma, ligaments of the wrist have become overstretched or lax, then this may allow a ganglion cyst to develop from abnormal stresses around the joint capsule, allowing fluid to leak. Another theory is that the body initiates the development of a ganglion cyst to stabilize an unstable area, again in response to ligament laxity. A comparison can be made to the formation of bone spurs that occur in response to joint instability or ligament laxity. The body does what it can to stabilize an injured area. An old-fashioned treatment option for ganglion cysts was for someone to smash it with a large book like a Bible; hence another name for ganglion cysts is “Bible cyst”. It often worked to reduce the swelling of the cyst by rupturing the walls of the cyst allowing the fluid to disperse into the surrounding tissues, but the recurrence rate was high. Nothing to say about the risk of injuring other structures with this method. Draining or “aspirating” the cyst sometimes is curative, but often the cyst returns as the reason for its formation has not been addressed. Surgical removal is another option that people seek out when the ganglion cyst becomes painful and/or unsightly. Again, even after surgical intervention, the cyst can return if the person continues the repetitive motion that caused it to form in the first place. This regenerative injection treatment initiates a healing inflammatory response allowing for soft-tissue repair of cartilage, tendons, ligaments and joint capsules. 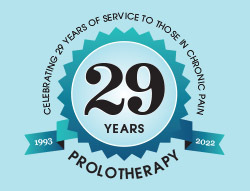 Prolotherapy mimics what the body does naturally in response to a soft-tissue injury. In the case of ganglion cysts, Prolotherapy can frequently strengthen the structures affected by the cyst enough to become symptom-free. This regenerative injection therapy brings to bear the healing properties of the immune system, similarly to how the body heals a sprained ankle, which is really a ligament sprain. The injured ankle gets red, swollen, hot and painful, or “inflamed”. These are the signs and symptoms that the body is trying to heal the area. Sometimes because of the severity of injury or the fact that a person continues to repetitively do the aggravating motion, the body cannot completely heal the area. 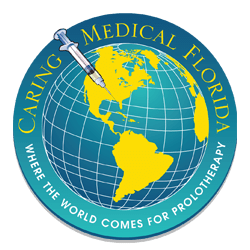 Prolotherapy injections restart this immune response right at the point of injury, whether it is a ganglion cyst, low back sprain or knee meniscal tear. One of our nurses complained to our Medical Director, Dr. Hauser, that a ganglion cyst on his left wrist was becoming problematic. Push-ups were one exercise that he had done for years, repeating three sets of 60-80 push-ups three times per week as part of his exercise regimen. It got to a point that the area around the cyst was so painful and weak that he skipped his usual push-ups several times a month. In addition, every time he bumped the cyst on a hard object, it would cause a sensation like striking your “funny bone”, the ulnar nerve of the elbow. 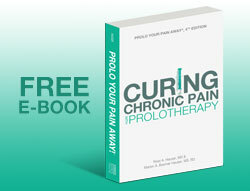 Dr. Hauser told him that Prolotherapy should help and treatments were initiated. 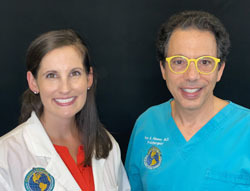 Our nurse had three treatments spaced about one month apart (most connective tissue injuries are helped by Prolotherapy within three to six treatments). Six years later he is still very happy with the results as the wrist is symptom-free. Even though the cyst itself remains, the structures surrounding it are now strong enough that he can do all the push-ups he likes and the nerve-like pain is gone. Oftentimes if an injured joint capsule or an injured ligament causes a small or recently formed ganglion cyst, the body can reabsorb them after Prolotherapy treatment. In cases where someone, like our nurse, has had a ganglion cyst for decades, then the cyst may remain but not be a problem anymore after Prolotherapy injections.